I am not a big drinker. We’ve had enough of those in our family. I like to drink wine, and I will have one or two beers in a Summer season. I rarely drink hard liquor. But, I do make a batch of Bourbon Slushes at the beginning of the Summer. This will last until after Labor Day unless we have a get together and remember to share them with our friends. I craved 7-11 Icees when I was pregnant with my youngest three children who were all born in August. Being hugely pregnant in the summer is not fun. Icees helped. Bourbon Slushes are like the adult version of a 7-11 Icee. 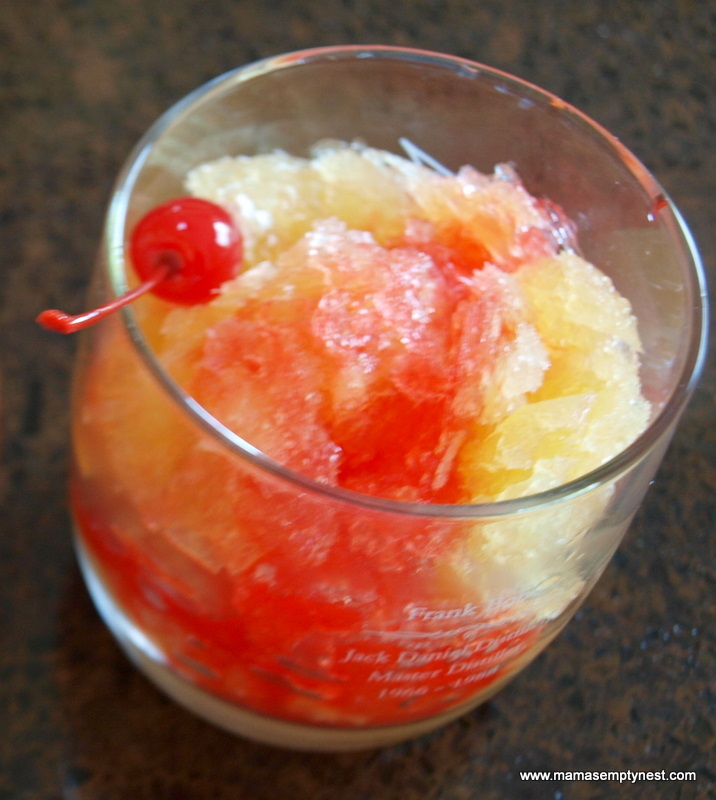 There are all kinds of alcoholic slush recipes out there. This one was adapted from one of my older organization cookbooks and was the recipe from one of the founders of that organization. I think the key is to use a good Bourbon. My dear, sweet hubby cringes when I use his Jack Daniels to make these. I use it anyway. Make a batch of these and enjoy some during a hot Summer’s night. Bourbon Slushes – ingredients. You can easily 1/2 the recipe for a smaller batch. Just use the 6-ounce cans of juice and 1/2 of everything else. Mix the ingredients together in a large bowl. Pour into plastic containers and freeze. After four hours, stir. Freeze for at least another four hours before serving. I find that using the flat containers works out well. First of all, they fit well in the freezer. Secondly, I always forget to go back and stir the slush mix after 4 hours. 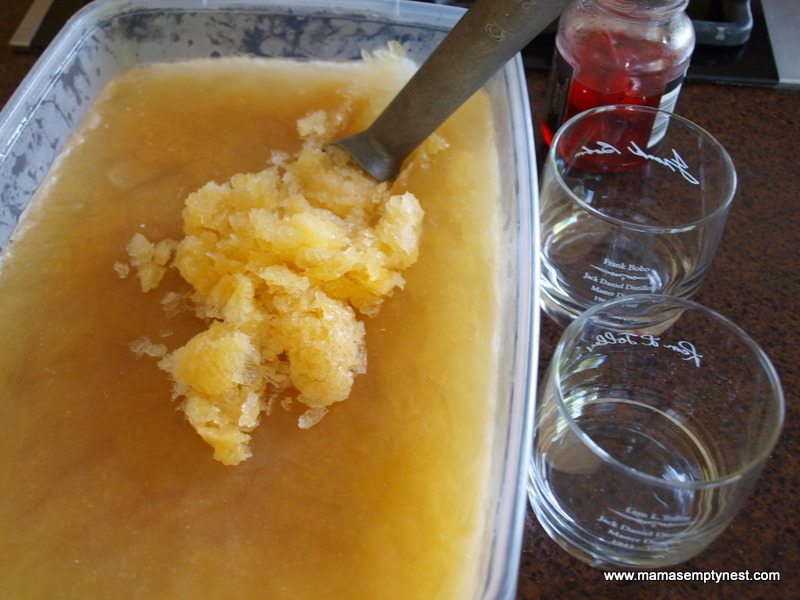 Using flat containers allows you to scoop through the slush since it seems that the alcohol tends to settle on the bottom. Here they are frozen. Simply take an ice cream scoop and scrape up the frozen loveliness and put it into a glass. I usually use my hubby’s Jack Daniels glasses. Oh, the sacrilege. Finish it off with a little Grenadine or Maraschino cherry juice and top with a cherry. Hubby complains about me using the Jack Daniels, but he sure enjoyed a few of these over Memorial Day weekend after working in the yard all day. Mix all ingredients together in a large plastic bowl. 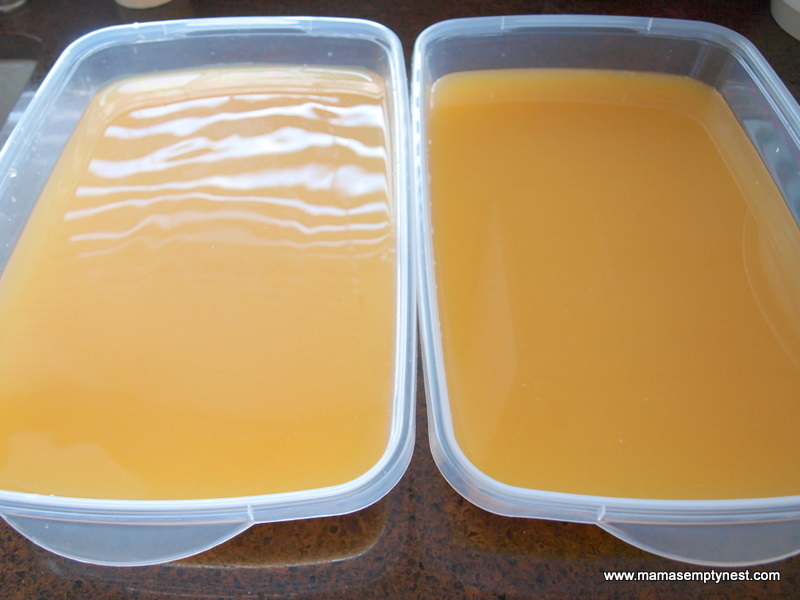 Divide into plastic containers and place in freezer. 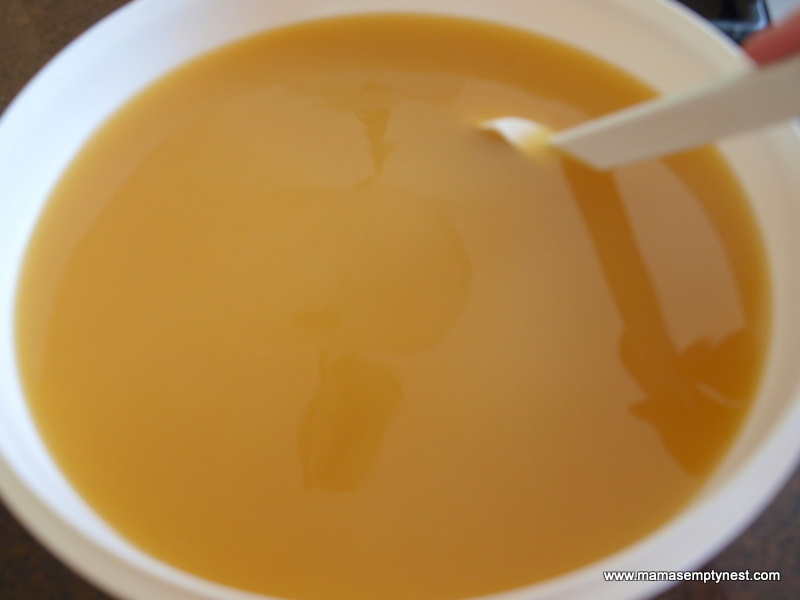 After 4 hours, stir. Return to freezer for at least another 4 hours. When ready to serve, use an ice cream scoop to scrape the frozen liquid into a beverage glass. Drizzle with a little cherry juice or grenadine. Serve with a cherry. This entry was posted in Food & Home and tagged Beverages. Bookmark the permalink. Beth is not a big drinker either, but she makes a great bourbon slushie. Not sure what she puts in it. I will have to compare the two. I agree they are great on a hot summer day. Let me know if they are the same or different. You find these in a lot of the old church cookbooks, too. I saw that you made these. Did you like them? Big kid slushies. Yum. Uh Jack Daniels is not bourbon…. Okay, I stand corrected, http://www.huffingtonpost.com/2013/10/23/bourbon-vs-whiskey-infographic_n_4142691.html, but boy does Jack Dainels make a great bourbon slush or should I say whisky slush? 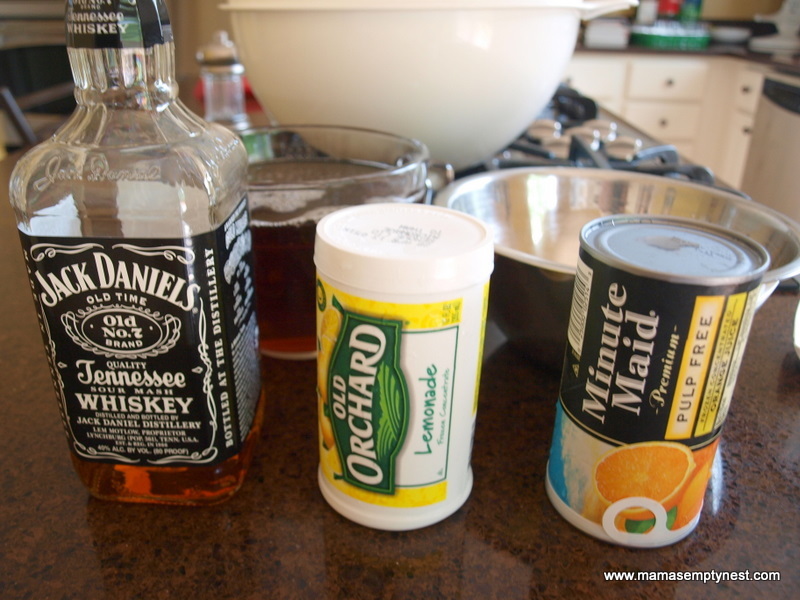 Why are you using jack daniels to make bourbon slushies??? If your going to make bourbon slushies use bourbon not tennesse whiskey!!! See my comment on the other post. I’ll just call it a whiskey slush when I use Jack Daniels from now on. Maker’s Mark makes good whiskey slushes, too. The flavor makes a difference! As I told my hubby, I used what was available in the liquor cabinet! But, he agreed, they are sure yummy! I use Maker’s Mark and for a bit of a twist use limeade rather than lemonade, and drizzle with cranberry juice. It’s a a bit tart in comparison. Thanks for sharing your recipe. Oh, that sounds yummy. There are also versions that use Amaretto, and they are good, too. Thanks for commenting and visiting! Me friendsfrien idea to make almost the exact same thing, the only difference being that the cherries and Cherry juice were INSIDE if the slush mix. Awesome recipe!!!! Thank you! !